Bikeland staff shares their favorite must have items for you or those on your gift list. It can be hard coming up with gifts seasoned riders have never seen or tried. This year Bikeland helps you be the genius elf. Friends and family will be amazed you found such innovative, “can’t live without” gifts. Non-riders on your list will enjoy some of these too. And don’t worry—we’ll never rat you out. Excited about a gas can? Yes, when it’s this trick. No Spill precision pour cans are a dream to use vs. typical EPA compliant can designs. No Spill cans feature a patented, thumb-button activated, multi-directional spout for easy, controlled pouring. The nozzle design allows more precise fueling, reducing spills and overflows. High Flow Rate (up to 3 gal/min), CARB compliant & child resistant. The two smaller sizes have a translucent strip to make capacity viewing easier. Available in 1.25, 2.5 and 5.0 gal sizes. 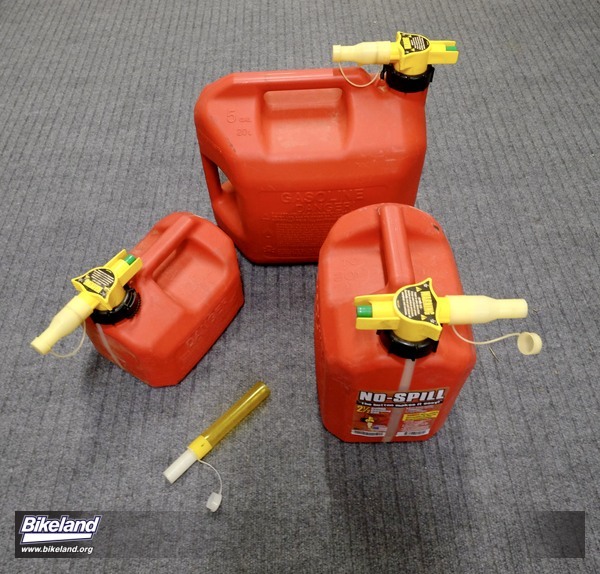 The five-gallon can is available in blue and yellow for kerosene or diesel. Don’t forget to pick up the nozzle extension (Honda P/N 06176-0206) for cars and trucks with recessed fill ports. Available at Honda motorcycle, marine and power equipment dealers, Cabela’s, Northern Tool and other retailers online. When we need to dodge the sun or just hide helmet hair we pack the foldable MotoSkiveez hat. 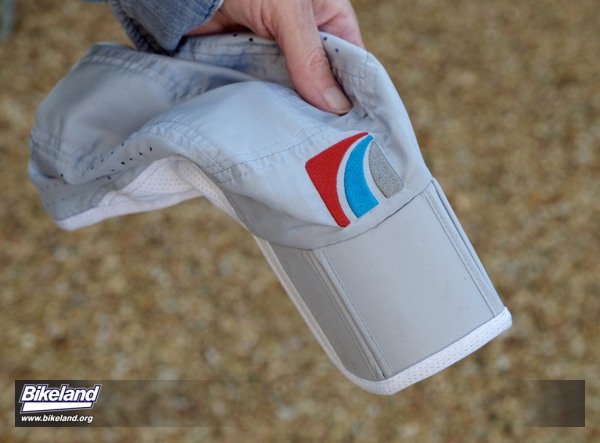 It takes about a third the space of a regular ball cap and keeps its shape after riding in a pocket. Adjustable and breathable. Yes at first glance it may look like duct tape but in action it’s a whole ‘nother animal. Originally developed for the movie industry to dust seal film canisters and camera bodies while leaving no residue. It’s non-reflective, formable, super holding, hand tearable and removes with no gummy residue. It separates cleanly enough we occasionally re use it in some situations. It’s easy to write on with felt tips and resists smearing and abrasion. Although more expensive than garden-variety duct tapes once you’ve used it you’ll always want a roll on hand. We’ll never dump our duct tape but we keep finding Gaffers is better for many things. Available in black, white and a variety of colors, widths and lengths. Make sure to get matte cloth backed vs. vinyl. We like 3M’s #6910. At camera stores, Jet, Amazon, Home Depot online. About $20 for average size rolls. A great product that’s been around over a decade but few people know of it. Patented “bolt within a bolt” design allows quick and easy removal of tie down bolts from trucks or trailer beds. So nice when you need a flat smooth surface. We use the “nut portion” with Grade 8 shouldered eye bolts for maximum strength. Online from Sears, Jet, Wal-Mart and Amazon. For attaching USB powered devices to a battery tender or electric vest SAE outlet. This simple adaptor has made it super easy to plug in and stay charged on short or long hops without adding cigarette lighter style or speciality power outlets. We only use one since all our street bikes have the SAE tender or vest connection. Available in dual or single port. 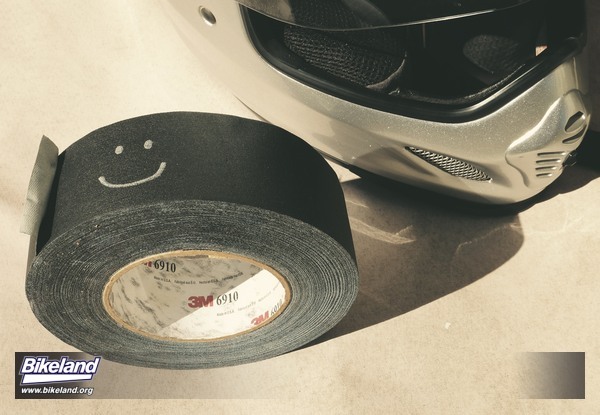 Quality and weather resistance may vary so make you get one intended for motorcycle use. From Aerostitch and other sources. We love RTV (room temp vulcanizing) silicone sealant. Problem is we can’t use it often enough. Regardless of how well we seal the squeeze type tubes from the big box stores it’s a losing battle. They quickly dry out and plug the nozzle as contact with air and humidity starts the curing process. We occasionally cut into the tube hoping to get a final fresh dollop but often find that’s toast too. Stored in cool conditions, manufacturers say shelf life is officially six to eighteen months but users know it can be mere weeks after opening. 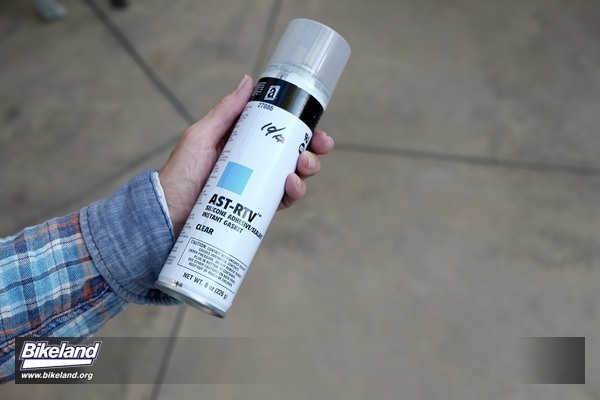 Aerosol RTV to the rescue. Manufactured in pressurized eight ounce “Cheez Whiz” type canisters, aerosol RTV cans have tight caps and self sealing plug nozzles. Product flows smoothly and controllably every time for consistent, easy applications. In Bikeland’s experience, (storing below 70 degrees) they last 2-3 years after first use. We love not having to run to the store or wasting a tube every time we need a dab. Made by CRC, AST, Loctite and others. Available in use-specific, RTV compounds. We prefer the clear general purpose. Available through Grainger, Fastenal, electrical supply houses and Amazon. We discovered these while creating truck bed tarp and equipment tie points. We added them to our dirt bike for additional tie down points. 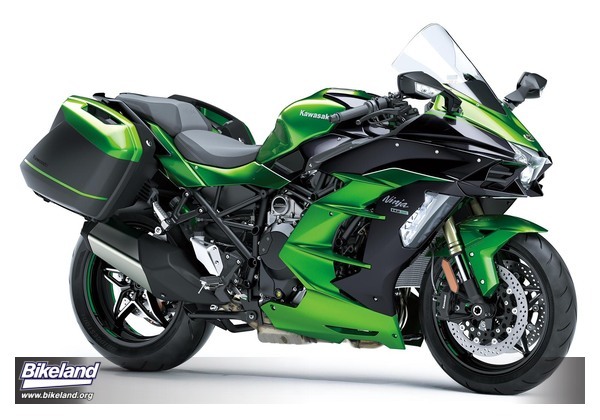 Or maybe you thought you would go big and surprise your favorite pillion to their own Kawasaki H2 SX or Ninja 400, just announced by Kawasaki USA today! Except... they won't be all that surprised since the whole world already knew about it from the EICMA show three weeks ago (the best kept secret since the Concours14 was for sale and in the hands of customers before it was revealed to the press). I guess mail from KMC HQ in Japan still travels to the US by steam ship. OK, so it wouldn't be a surprise, but they'd probably still be pretty happy with it.